United Way Simcoe Muskoka | The Youth United Council is prepared to bring positive change to Simcoe Muskoka! The Youth United Council is prepared to bring positive change to Simcoe Muskoka! 08 Apr The Youth United Council is prepared to bring positive change to Simcoe Muskoka! On March 22, our Youth United Council volunteers got together for training and orientation. We kicked things off by playing an icebreaker activity and getting to know one another. Our Georgian College Social Service Worker placement student, Alexandra, led the icebreaker activity by having everyone grab as many pieces of tissue paper as they’d like. Little did they know, every piece of tissue paper that was grabbed meant sharing the same number of facts about themselves. 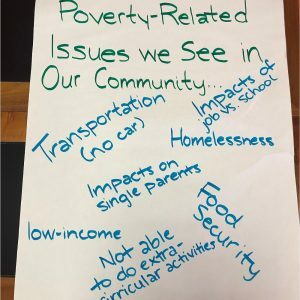 Our Youth Council brainstormed what poverty looks like in Simcoe Muskoka. As the activity gained momentum, we learned many unique aspects about our volunteers: Morgan lived in Finland for a year; if we don’t hear from Elora, she’s likely playing a sport somewhere; and Sarah is a 3rd year Science student at the University of Guelph. It was a fun evening filled with getting to know each other, having a great time and learning about their upcoming roles. Youth United is proudly supported by the RBC Future Launch program to fund youth-led projects throughout Simcoe County, Muskoka and the Town of Blue Mountains. The program encourages youth between the ages of 14-22 to partner with a Community Agency Partner (a registered charity) and receive a grant of up to $2,500 to implement a project that will help to reduce poverty in their community and create a positive impact with respect to growing social problems. Because Youth United is a program for youth to make a difference, this age group (14-24) applies to our Youth Council. This means that Simcoe Muskoka youth are a key part of the decision-making process to determine the youth-led projects that receive funding. Applications for Youth United projects in 2019 are now closed, but the real work is just getting started! Our Youth Council have completed their training and are now reviewing the individual grant applications on our new online Youth United Portal. After creating their own suggestions for the projects, each volunteer will form their funding recommendations. Our Youth Council will meet again soon to see presentations from applicants. The Presentation Day will allow Youth Council volunteers to ask the Project Leaders questions they had while reviewing the applications and enable the youth Project Leaders to express their passion for the project. Following that, the Council will meet once more for an allocations meeting and discuss the applications before submitting their final recommendations to our Community Impact Standing Committee. We feel lucky to have such inspiring and strong-minded youth on our Youth Council and to have creative project applications for them to go through! We’re excited to see what these amazing youth think about the projects and can’t wait to hear their recommendations. To learn more about Youth United, click here. 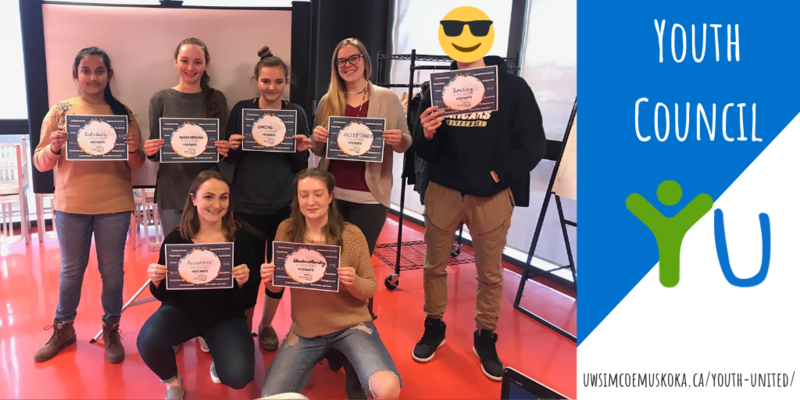 Follow us on Twitter and Facebook to see how our Youth United projects come along throughout the year and sign up for our newsletter to stay up to date on changemakers in Simcoe Muskoka communities. Youth Council members in photo, from left to right: Fariha, Morgan, Elora, Alexandra, Sarah and Gwen.